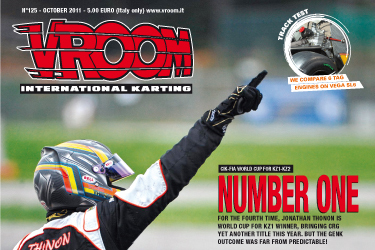 Jonathan Thonon makes it four World Cup for KZ1 titles out of six finals raced. If we also consider that he crossed the finish line first in 2006 and was later penalised for a jump start demoting him to the runner-up spot, Thonon has a truly impressive entry/win ratio. For those who were in Genk, it will be easily remembered as his most exciting title to date. Full report from Genk, plus a lot more, including an interview to the CIK Vice President Kees van de Grint, in this issue. A foreword on the anticipation of this KZ1 World Cup is taken for granted, everyone was aware that would be a much harder battle than last year’s, when Lammers won. Nyck De Vries becomes the hero of karting, a character that has always been lacking in this motoring sport. A fundamental reference point for drawing fans to the sport and follow in their idol’s footsteps. Joey Hanssen takes a deserved win of the first edition of the of the KZ2 World Cup. The Dutch driver’s curriculum wasn’t very important before this event where he is outstanding and shows all his driving skill and evidence his experience in cars too. 18th September, we talked to CIK Vice President Kees van de Grint, who spoke about present and future projects of the CIK. Brit Matthew Graham, Finn Pyry Ovaska and Italian Antonio Giovinazzi confirmed their strength as they constantly battled it out up front during their different qualifying rounds. The fourth and final round of the 2011 Rotax Max Euro Challenge saw the crowning of the new champions at the famous Gabriel Thirouin circuit at Angerville in France, in what was already anticipated to be nothing short of a showdown. Unrelenting bad weather characterized AKOC second round at the Carmona Circuit in the Philippines. Despite the weather hitting monsoon-levels and proceedings having to be delayed, the drivers raced their boots off for the pleasure of the many fans. We open our National Races section with the superb TVKC Kart Masters at PF International in the UK, featuring a stunning 239 entries for its 16th edition. We report the conclusive round of the BNL Series from Belgium, and the biggest street race in the world, the Rock Island Grand Prix, always prize-plenty. From the other side of the world, Kartight Speedway held the 4th round of the Singapore Karting Championship; Pekan played host to the 4th round of the Malaysia / Asia Zone Rotax Championship; while Geelong was the track of choice for the Rotax Nationals. With such a action-filled issue, we couldn’t renounce to at least 6 pages Gallery section, with the best and the ‘worst’ by our photo correspondents from around the world. In the news section you find the latest from the CIK; a heartfelt good-bye to the charismatic Martin Hines; Martin Rump reinstated as Rotax Junior World Champion; Art Grand Prix set to hit the kart tracks; the Rotax Festival for Micro and Mini classes in Portugal; and Kilt Carburettors future projects.